10143 Death Star II, released in 2005, is a set in the Star Wars collectors' line. It has 3449 pieces, more than any other set at that time. 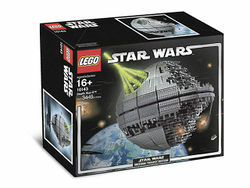 It includes a miniature model of the Executor, the Death Star II itself, and a display stand with further information. Like its predecessor, the Death Star II was made of quadanium steel and equally divided into two hemispheres, which were in turn subdivided into 12 zones. The newest incarnation of this dreaded superweapon, however, had a monstrous diameter of over 900 kilometers, demonstrating the intellectual and physical evolution of the Death Star I. If completed, the planetoid would have likely boasted a hyperdrive system similar to the original, comprising 123 (or more, given the larger size) individual generators. The second iteration of the battlestation was also designed by engineer Bevel Lemelisk, the original Death Star's designer. Lemelisk was executed for the design flaws in the final version of the destroyed Death Star I, but was cloned by Emperor Palpatine in order to redesign the superweapon, eliminating the flaws of the former battlestation. In the newest version, he added thousands of turbolasers while removing any external weaknesses. The most important revisions to the Death Star design made by Lemelisk were made to take into account and eradicate the technical flaws of the original battlestation which had enabled it to be destroyed during the Battle of Yavin. The first major change made in this redesign was the elimination of the two-meter-wide thermal exhaust port that was used to ignite a chain reaction in the main reactor of the first Death Star, destroying it. This was greatly improved, from a defensive standpoint, in the new revision. Instead of venting gases out of a single port, millions of millimeter-wide exhaust ports were scattered over the surface of the station, each of which propelled a small amount of the excess heat and gases into the vacuum. The new system also took advantage of new highly-advanced protections and safe-guards that would seal the small exhaust ports in the event of any unexpected excess of heat or energy. The second main advancement in the second Death Star battlestation was the improvement of its superlaser. Still located in the northern hemisphere of the battlestation, the much improved superlaser equipped in the second Death Star was much more powerful than its predecessor, and took only three minutes to recharge, in comparison to the 24 hour recharge required for the first Death Star's superlaser. In addition, while the first Death Star only had the capabilities to fire on very large targets, such as planetary bodies, the improved superweapon was upgraded with additional lower-power weapon fire options and targeting systems that were more suited for fine-tuned accuracy, while still maintaining great destructive power, in order to fire the powerful weapon on enemy capital ships. The increased external surface area of the new station also allowed for larger amounts of conventional armaments, such as turbolasers and other defense batteries, to be placed, further increasing the already impressive Death Star's defenses. The Death Star II was destroyed by Lando Calrissian and Wedge Antilles during the Battle of Endor. According to the UCS Promotional Poster, this set was retired in 2007. This is a description taken from LEGO.com. Please do not modify it. (visit this item's product page) Construct the galaxy's ultimate battle station! 'No one who saw the dreaded Death Star in the classic Star Wars films could ever forget it. Now you can build your own to add to your LEGO® Star Wars collection! This incredibly detailed and faithful replica of the Death Star II from Star Wars: Episode VI Return of the Jedi will make an awesome addition to any Star Wars collection. The partially constructed Death Star looms in space above the forest moon of Endor, super laser ready to fire. This unique collectable is sure to rank as one of the greatest LEGO Star Wars models ever produced! Measures a full 25 inches (65 cm) high and 19 inches (50 cm) wide (including stand). The DSII on its stand. The Death Star II without superlaser. Facts about "10143 Death Star II"
Construct the galaxy's ultimate battle station!